I dragged myself out of bed with the mosquito net basically in my mouth from tossing and turning all night excited for my next venture: hitchhiking to Playa El Tunco in El Salvador. The night before, I had met a couple from Canada named Alex and Luke — two new-age hippies who met while tree-planting and decided to do a road trip from Canada down to Panama in their yellow 1970s Volkswagen van. After talking, it turned out they were heading to Playa El Tunco and within minutes it was decided that I would hitch a ride with them. Because, why not! At 8 a.m., we hit the road and left the sleepy beach town of Monterrico with Bob Marley playing in the background as we swerved past giant potholes en-route to El Salvador. The border crossing took hours — we sat in line, sweating, with no air conditioning and our remaining bottled water now as hot as the sun. We noticed a watermelon truck in front of us and managed to convince the driver to sell us one for $1. He tossed it down to us, Luke used a machete to cut it into giant chunks to eat and we ended up covered in watermelon juice down to our elbows without a care in the world. Eight hours later we finally made it to El Tunco and an ice-cold cerevesa never tasted so good! We made it just in time for sunset, and we knew we had made the right decision in coming here. To this day, I have never seen a sunset so beautiful. The next day we met a local named Luis — a surfer and unofficial tour guide who said he could take us on a hike where we would be able to see some incredible hidden waterfalls off the beaten path, and have a chance to go cliff jumping. Immediately, we agreed, and after gathering around 15 other travelers, we jumped into the back of a pickup truck and headed 20 minutes uphill to begin our hike down to Caminata Cascada. The whole trip took four-and-half hours of hiking, rock climbing, and practically turning into Tarzan holding onto vines and ropes trying to keep your balance while scaling a cliff in order to get down to the waterfall. It was the most intensive and challenging experience, but worth every second once we arrived at Caminata Cascada and jumped off 10 feet cliffs into the refreshing waters! 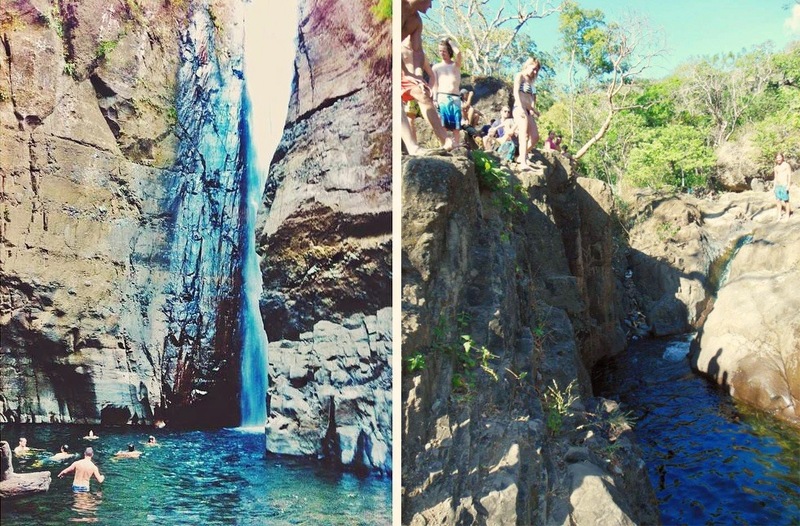 Left Image: We FINALLY made it to Caminata Cascada and boy, was it worth it! Right Image: Taken seconds before I did my first cliff jump! El Tunco has an energy to it that can only be experienced to understand and will make it hard to leave. It has a hopping nightlife, fantastic food, and some of the friendliest people I’ve ever met! This is one place you won’t want to miss! Currency: Everything is in US Dollars in El Tunco. I can’t rave enough about this hostel — The place truly is a gem and you will feel like you’ve hit the jackpot when you arrive. Beautiful layout, huge pool, “dorms” consists of 1 bunk bed and 2 single beds with air-con, beer from the bar costs $2 (same price as the tienda! ), you’ve got a ton of free things to do there and not to mention, you’re around the corner from everything you need! • Large bathrooms with rainfall shower head and warm water! Street Pupusas: corn tortilla filled with your choice of ingredients: cheese, pork, chicken, beans, garlic, jalapeños, mixed, etc. Cabbage slaw with red chilies and vinegar is then put on top. La Libertad — Take an easy 15-minute chicken bus for $0.50 to the market where you can buy fresh fish and vegetables. 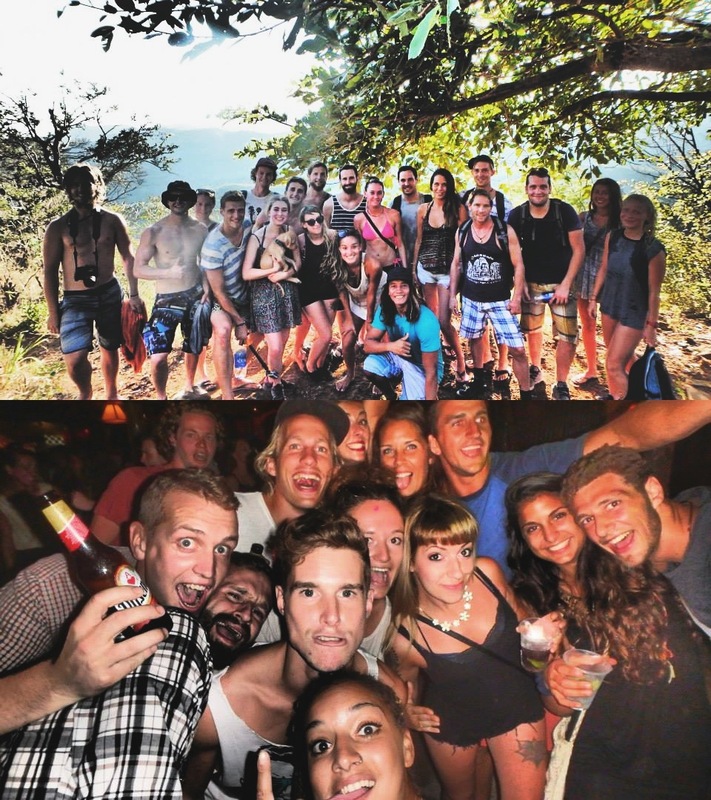 A group shot to commemorate our crazy adventure back from Caminata Cascada & the after party at D'Rocas! • Watch the most incredible sunset of your life — it will be a highlight of your time in El Tunco. 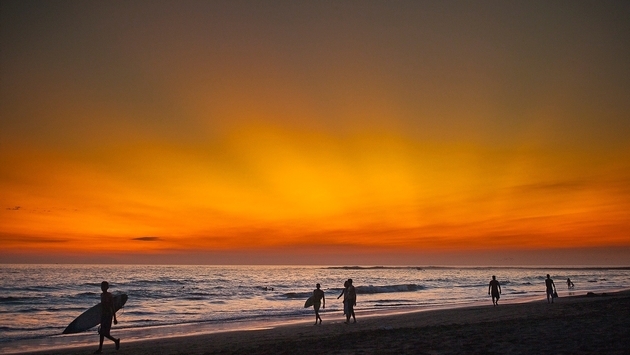 • Surf — El Tunco is one of the best surf spots in Central America. Rent a board for $10 or take lessons for $10 an hour. • Explore Caves — Head to the beach and walk eastward; it’s about a ten-minute walk. • Eat and Drink — Get fresh coconuts and pupusas for 50 cents, incredible $2 smoothies, and mouthwatering burritos found on the main drag. • Check out El Tunco’s Micro Brewery — A 2-minute walk from the main street, you can sample a small selection of local beer brewed in-house. • Chill out! 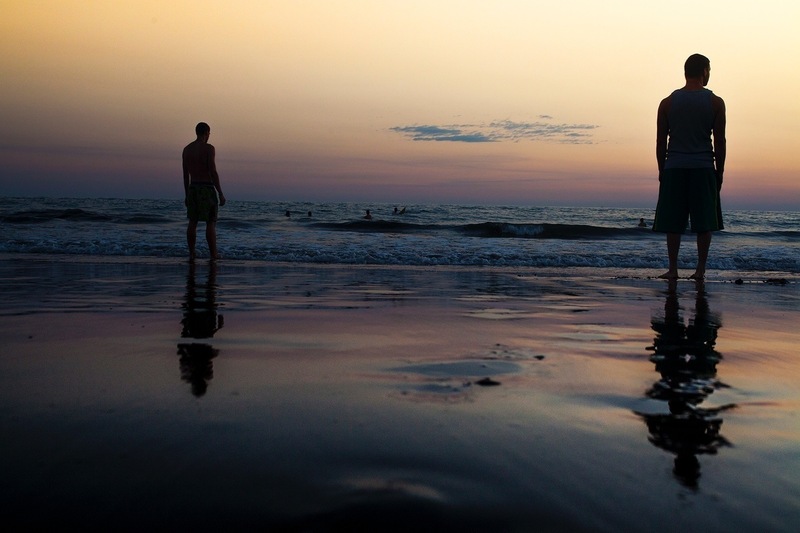 — After a fun night of dancing, relax on the black sand beaches of El Tunco, or float your day away in the pool!